This old church is the main – some would say only – landmark in Taiban, New Mexico. It’s on the route between home and Albuquerque or Santa Fe, and I stop in nearly every time I’m through town. Last spring, the glassless windows were nice frames for a view of the prairie east of town. 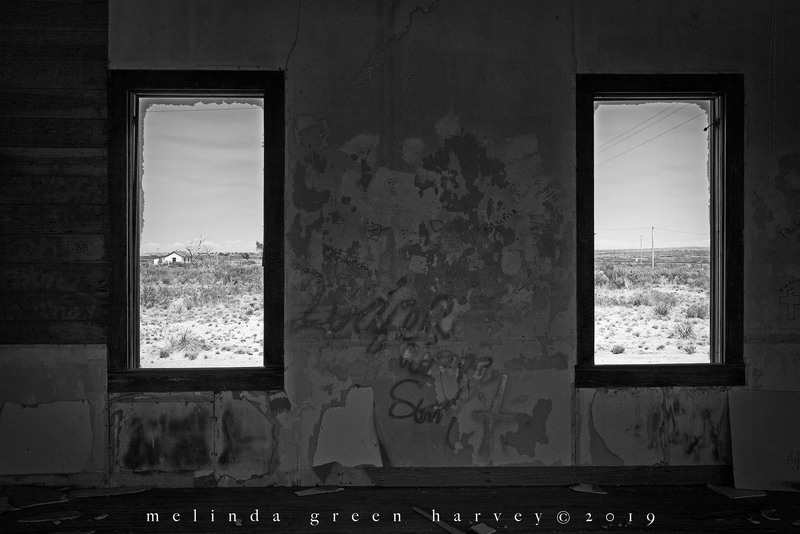 Posted on April 4, 2019, in Photography and tagged 365 photo project, abandoned buildings, black and white photography, church, learning to see, Leica, melinda green harvey, monochrome, new mexico, one day one image, photo a day, photography, postaday, road trip, taiban, taiban new mexico, take time to look, thoughtful seeing, travel photography. Bookmark the permalink. 2 Comments. Very nice composition. Definitely has DOF and sense of expanse and loneliness. Thanks, Richard. This photo is nearly a year old, and I can’t figure out why I overlooked it when it was new!